This high quality Plug Cutter includes 1/4", 3/8", 1/2" and 5/8" sizes. 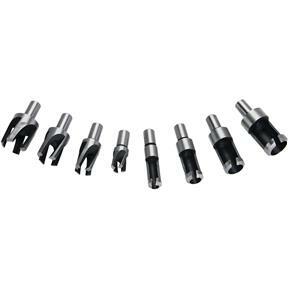 This set includes four plug cutters and four 1" long tenon cutters. All shanks fit 3/8" drill chucks. Made in an ISO 9001 certified factory! Getting great plugs to fill those dowel holes giving some class to the finished product.